Have you always wanted to be able to relax by the sea and enjoy the sun, while at home? PALM Real Estate offers you the opportunity to make this dream come true by investing in a sea view villa on the French Riviera. Take a look at the selection available on our website and choose the sea view villa that best fits your needs and your budget. 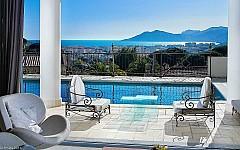 The sea view villas on the Riviera presented in our offer are contemporary style, Provencal or Tuscan properties. They all offer breathtaking views of the Mediterranean coast and they all make you enjoy the idyllic Provencal life, with its pleasant climate, beautiful surroundings and cultural effervescence. Among the sea view villas for sale presented in our portfolio, you can choose a recently built villa in Croix des Gardes, Cannes, 5 minutes from the city center and the beaches, which consists of a fully equipped kitchen equipped with fireplace, large living room, 3 bedrooms with bathroom, dressing room, swimming pool. You can enjoy the sea and the Esterel mountains from the large terrace. You can also opt for a sew view villa for sale or rent on the French Riviera in Super Cannes, one of the most popular areas of the city. It is located in a private estate, with a 100m² open plan kitchen, 6 bedrooms with dressing rooms and bathrooms and a jacuzzi terrace. You can also choose to live in a villa composed of summer kitchen, living room / dining room, 5 bedrooms with bathrooms, dressing rooms and numerous terraces offering breathtaking views. If you want to get away from the city and enjoy nature, PALM REAL ESTATE also gives you the opportunity to invest in a sea view villa on the French Riviera in the heart of the Esterel mountains, in a closed domain offering one of the most beautiful views of the French Riviera, from the Bay of Agay, to the Dramont peninsula and to Saint Tropez. Whatever your decision may be, do not hesitate to contact PALM Real Estate if you are looking for a sea view villa on the French Riviera or elsewhere in the south of France. We are always ready to assist you in your real estate project.